Wishing Well is an international repository of wishes represented as video, images and text thought-bubbles sent from cell phones, emails, and social networking sites to a web server, and is displayed as data light projections into a physical pool filled with water that doubles as a screen. Wishing Well is both a virtual web experience and a physical interactive installation that represents and continually activates the healing wishes of people around the world. 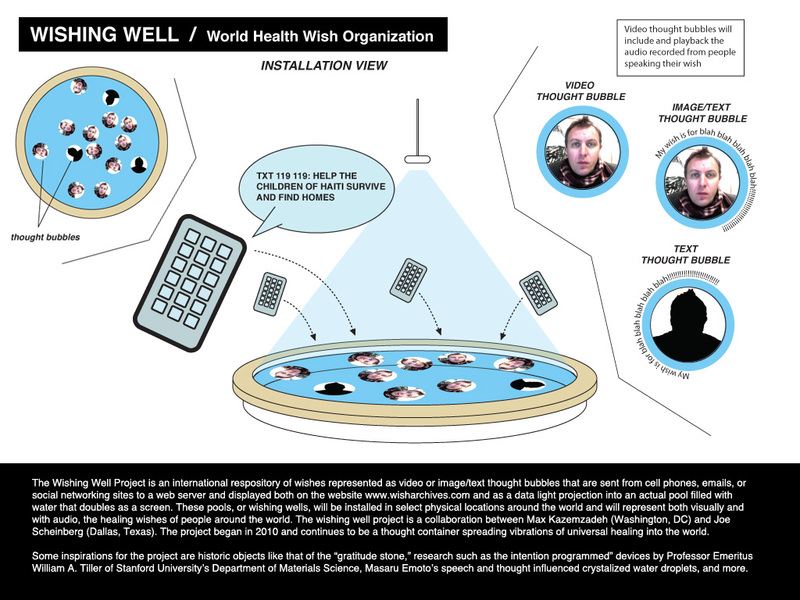 Using an open BSD license, the Wishing Well application collects and formats wishes for activation, pairing images of the user with their text-based wellness wish in the form of animated bubbles. Submitted wishes stored on the web server are downloaded from the onsite Well application, and projected from the ceiling into a 4 inch shallow pool of water with a white basin. On-site visitors can sit at the edge of the well and push the “floating” wish-bubbles around in the water with their hands. Like wishes will gravitate together, creating bubble-clusters, as well as send messages to social networking users to encourage wish-based focus groups. One of two Wishing Well visualizations will run onsite and the other online. The onsite application will decode several videos and audio streams simultaneously. The online application, however, in its first phase, will only load photos and text into online wish-bubbles. The Wishing Well Website is powered by Joomla & built in PHP. A MySQL database manages the data. Joomla's Content Mgmt Sys. (CMS) manages site content & turns away wishes inappropriate for public display. The front-end lets users create usernames, login, share thoughts on forums, upload wishes, & track where their wishes were displayed. A Facebook App written in PHP uses the PHP wish interface to display current wishes, add new ones, & track where wishes were displayed. The Java App, built w/Processing, allows users to visualize wishes currently on the wish server. It uses the server’s TCP/IP Wish Interface to cycle through server wishes. Admins will approve wish content. The On-site App uses C++ & C#, & decode video in parallel. Wish Interface (WI) is a common gateway to all wish data. On-site well and Java well apps will use the WI. FFmpeg converts all video & audio. Video & audio is encoded with Ogg Vorbis and Ogg Theora. Cronjob invokes the converter to reformat content & uses PHP to add wishes. Based on traditions like the “gratitude stone,” W. A. Tiller’s research at Stanford University with “intention programmed” devices, and M. Emoto’s thought influenced crystalized water droplets, the Wishing Well investigates the notion that automated, mechanized, or embedded thought has the potential to impact the physical world as much as those from their organic counterparts. Since the Wishing Well is running on a web server, many computers will simultaneously rethink submitted wishes, creating an artificial thought network. Priority is given to bubbles “bumped” by onsite visitors. Every fifteen seconds, one bubble cycles off screen and another onscreen from the database. When a new wish bubble is submitted to the Well, it cycles the oldest on-screen wish off, to wait for its next turn onscreen. The projected number of bubbles onscreen at one time is targeted at 25. People may visit www.wisharchive.com for a more complete description of the project (with images/video), to upload a wish, view the online Wishing Well in real-time as seen in the physical location, and information regarding activity within the social networking framework. Wishing Well is a collaborative project between Max Kazemzadeh (Washington, DC) and Joe Scheinberg (Dallas, Texas).